Viking Roses is a collaboration between Rosa and Harley Eskelund and John Pouw (DVR Marketing B.V.). 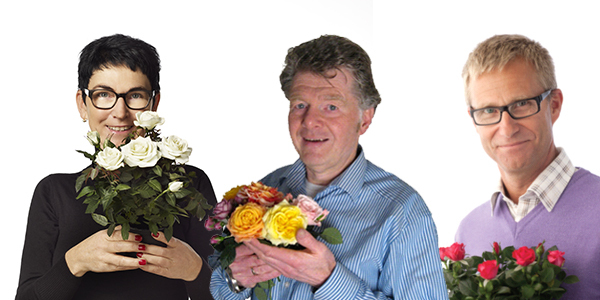 Rosa, Harley and John have known each other for over 25 years and share a passion for roses and marketing. John successfully launched the first genuine consumer brand for a cutrose in New York: TRUE.® In his search for a better variety for this he teamed up with Rosa and Harley three years ago. In Viking Roses Rosa breeds and John markets. Together they select. Harley balances off the passion with common sense. Viking Roses are grown and tested in Denmark, The Netherlands (first in the open air, then in the greenhouse), Kenya, Ethiopia, Colombia and Ecuador. Through their log-in, farms testing or growing the Viking varieties are kept up-to-date about the performances and marketing of those specific varieties worldwide.